There were several incidents with Kendall (see last post). She was the only dog that was sprayed by a skunk! It was just as SHE was heading out to school. SHE quickly undressed and washed Kendall in the shower with tomato sauce--having read that that works. Kendall smelled like a skunk-sprayed pizza! Kendall also jumped out of the car at the beach on Cape Cod and disappeared into a wooded area with HER in hot pursuit. SHE came to a small house with a woman at the door. Kendall was curled up IN BED with a strange man and would not come. SHE finally had to peel her off the man's thigh while apologising profusely. After a couple of years in Australia, SHE got the 'call of the scottie' again. Kelly was named after a little student...7 year old-- who brought back a stencil and said she didn't feel like doing maths that day. Okay, but this is not going to happen again. And it never did. Kelly was a wonderful companion. She went to parties or just visited or on holidays. Every night she had to run through the house, dinner bowl in mouth, growling, and throwing it around before she brought it back to be filled. But that old feeling came back--enter Bruis. (character out of a book.) He was a sweet boy. SHE never even thought he was old enough to be a father.....until Kelly had seven puppies! dogs stayed home. One night, SHE came home early and there were no dogs! SHE was living in a townhouse, and sprung the neighbours, there was a loose board in the fence and every Tuesday night they invited the dogs over for the evening. It was how SHE met the neighbours. He eventually developed a skin problem. SHE thinks now it may have been demodectic mange. At that time there wasn't a way to cure it, so he was very itchy. He died from an unrelated accident at about 4--SHE still feels guilty about that. Kelly died too early, as well. SHE thinks she was kicked by a horse. Whatever it was, Kelly died on the operating table. But the memories are still fresh. 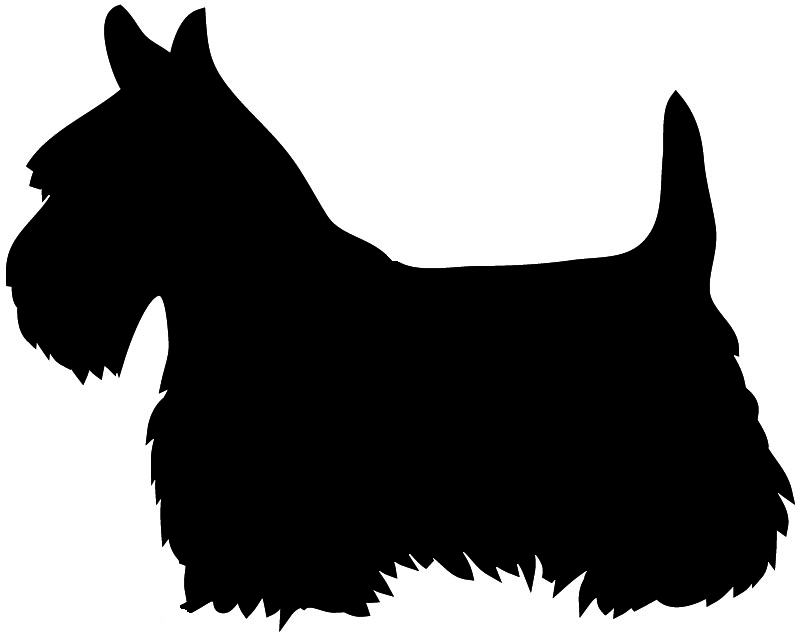 Actually it is a history of HER scotties. These stories precede digital cameras, so no photos. bought after landing the first permanent job..a clerk-typist for the General Accounting Office. so he didn't last long. 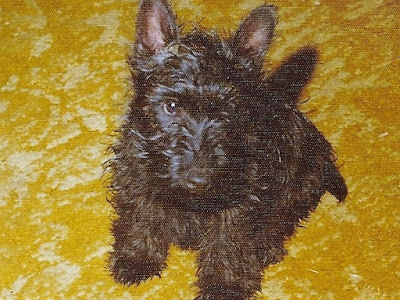 After college, with a permanent teaching job, SHE visited one of those puppy pet shops (wasn't aware of puppy mills at the time) and was looking at a young, male scottie puppy. The sales woman, kept drawing HER attention to an older female puppy and suggested SHE play with her for awhile. You can guess what happened next. SHE said SHE'd take her. The sales woman burst into tears and went racing to the front of the shop yelling, "Scotty has a home!" This puppy had been brought in with several and was just the one left. The sales woman said she would have taken her, but they had seven dogs and her husband said no more. The whole staff came out as pup and gear were loaded in the car, waving goodbye! Kendall eventually went to live with an aunt and uncle, in their 80s, who loved her so much, they put their mattress on the floor, so Kendall could get on and off easily! Some dogs have been digging up the grass. Even up-turned garden furniture didn't deter the digging. River sand was used to fill up the holes. 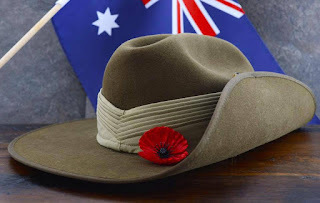 Today, Australia and New Zealand celebrated ANZAC Day. It's a day to remember the original ANZACs who fought in Gallipoli during WWI. they fought as a country. not becoming a country until 1901.
but combined with what it means to be Australian. and the Research Stations in Antarctica. Wherever people are currently serving in the world. We went to the river, and then home. with all the who braved the wet for the ceremonies. The new puppy was coming to the river this morning. ...we had to wait for all his needles to take effect, before he could be introduced to us. I, Roxy, woke up with a Very Sore Paw. Here's evidence, though it was taken later in the day. I wasn't allowed to go. SHE says it was from chasing Coco like a maniac the day before. stand in the river and get wet and muddy. Only Dui went and he's more of a maniac than I am! His name is Tiger. He is Pi's new brother. And had to go on the dreaded chain for awhile. before Bella and I get to meet him. Hope your weekend is better than mine....sigh. 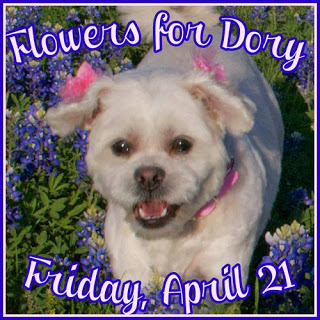 Today we join in Flowers on Friday in memory of Dory. It's Autumn here now, so we weren't expecting to find any in our little garden. Our bottlebrushes are starting to bloom. And other plants have new growth. We hope we gave Dory's family a smile. The temps are cooler now in the morning. waiting for the first warming rays of the sun. Last week, they had the moon for company. Hope everyone is enjoying a great weekend and Easter. 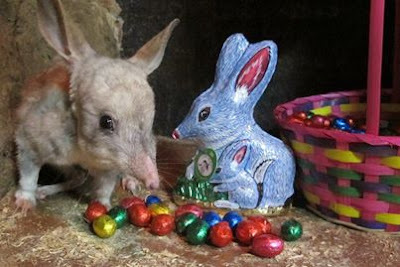 We had a visit from the Easter Bilby. and a Hot cross bun. We also opened TWO packages! The first was from Lee and Sweet William. Lots of tasty things for HER! 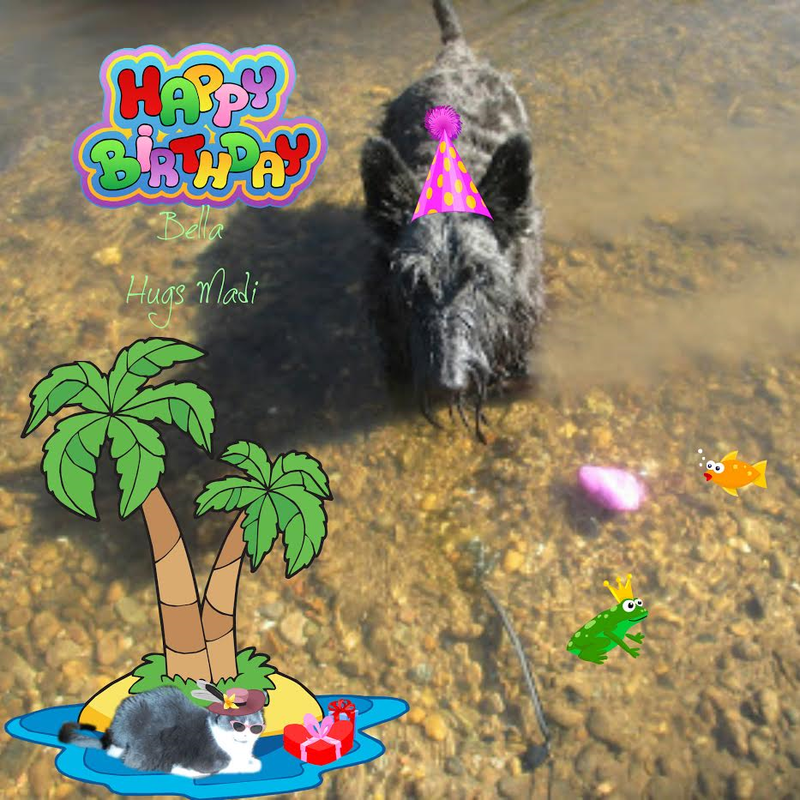 SQUEAKY toys, and Greenies and Chik'n Treats! 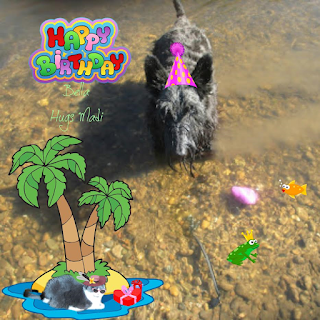 Then we went to the river for two hours to play with our friends. Stop waving that trotter around to show off your new socks Sweet William sent and give it to us! We had another big walk in the afternoon, so SHE could walk off all those Peeps and chocolate. Thanks for all the fantastic things. Hope you're enjoying a Great weekend, too. Just the way we like it! Have a Happy Weekend everyone! We'll be going to the river FOUR days this weekend. SHE'll just have to put up with wet dogs. We went on two OUR walks today. It was a wonderful day. Happy Birthday, Bella! We love you! kibble 8, 'roo chew candles and parmesan sprinkles. We had a few comments yesterday--okay, two comments--asking about the white, nutty-looking things in this photo. We're assuming they weren't referring to Roxy...BOL! They are the seed capsules of Callistemons. Known locally as Bottlebrush trees. You can see how they got that name. As they are native drought-resistant plants, that come in many sizes and colours, we have a variety in our garden. Amazingly, the seeds can stay in the capsules for years. Some will open after a bushfire to reseed. The tree that Roxy was behind is our Mystery Tree. We planted a Banksia--and that grew instead! and occasional RUNS at the Sportsground. We are two scotties and a spotty. Our Daisy went to the Bridge in February 2014, but we're keeping her name in our title. Bella is the oldest, now at 9, Roxy the spotty--Bull Terrier X Rhodesian Ridgeback is 7, and Macdui is 4. He is now larger than Bella.